Fact: About 66 million years ago, at the end of the Cretaceous period, 75 percent of plant and animal species went extinct, including the dinosaurs (except those that evolved into birds). Fact: About 66 million years ago, an enormous asteroid or comet hit the Earth near what is now Chicxulub, Mexico, throwing rock, dust and water vapor into the atmosphere. 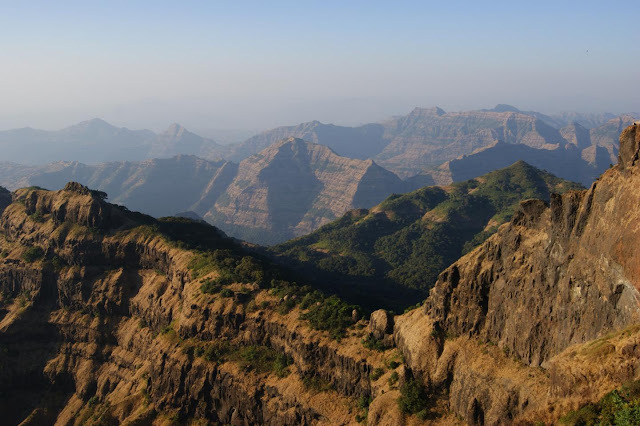 Fact: About 66 million years ago, a massive volcano erupted lavas in India that are now called the Deccan Traps, burying much of the subcontinent under more than 11,000 feet of basalt (lava rock) and pouring poisonous gases into the atmosphere. Princeton geoscientists Blair Schoene and Gerta Keller led an international team of researchers who have assembled the first high-resolution timeline for the eruptions in India's Deccan Traps. Their research appears in the journal Science. "Everyone has heard that the dinosaurs died from an asteroid hitting the Earth," said Schoene, an associate professor of geosciences. "What many people don't realize is that there have been many other mass extinctions in the last 500 million years, and many of them coincide with large volcanic outpourings" from the massive volcanoes known as flood basalts or large igneous provinces. Keller, a professor of geosciences, has argued for decades that the eruption of the Deccan Traps caused the dinosaur mass extinction. In 2013, she, Schoene, and his students began trying to find the ages of the thick layers of lava, which were known to be about the right age but had never been precisely dated. Schoene uses several techniques for geochronology, the science of assigning ages to rocks. The most famous geochronology technique, usually called "carbon dating," uses the decay rate of radioactive carbon-14 to find fossils ages. That works for plants or animals that are a few thousand years old, making it useful for archaeology but not for 66-million-year-old basalt. For rocks from around the time of the mass extinction, geoscientists have a few choices of naturally radioactive materials. Uranium-lead geochronology yields very precise ages, but minerals containing uranium rarely occur in basalt, the rock that makes up the massive lava flows; uranium-bearing zircon is more often found in explosive eruptions from Mount St. Helens-type volcanoes, which have a more silica-rich chemistry. The researchers were aware that the odds were stacked against them. "I don't think that any of us anticipated that our first trip to the Deccan Traps would lead to the type of dataset that we were able to produce," said Mike Eddy of the Class of 2011, now a postdoctoral research associate in geosciences and a co-author on the Science paper. "During our first week in India, we found a high-silica ash bed between two basalt flows, and it got our gears turning," Eddy said. The researchers knew that silica-rich volcanic ash could easily contain the tiny zircon crystals that preserve radioactive uranium. "The real breakthrough came a day or two later, when Blair realized that the fossil soils may have also collected this type of ash in small amounts," Eddy said. Over three field seasons, the researchers gathered samples from more than a hundred sites and shipped them back to the lab at Princeton. "It is always entertaining when we ship samples at the end of the trip," said Eddy. "This frequently involves a full day, starting with finding cardboard boxes that have enough structural integrity to make it back to the USA, packing said boxes, a visit to the post office to pick up the necessary forms and have the boxes inspected, a visit to a cloth shop to buy canvas, a visit to a tailor to have the boxes sewn into canvas bags, traveling around town to numerous ATMs to collect enough cash to ship the boxes internationally, and a final few hours of paperwork and stamps to get the boxes out the door. In total, the entire process can take up to 12 hours." 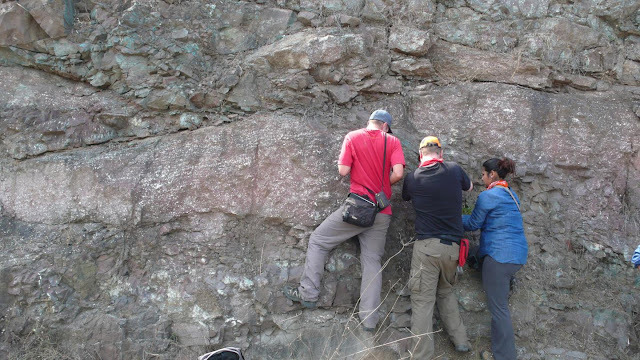 Of the 141 sample sites, 24 yielded uranium-bearing zircon crystals, which allowed the research team to conclude that the Deccan Traps erupted in four distinct pulses, each time belching enormous volumes of sulfur and carbon dioxide into the atmosphere. The thousands of tons of lava would have killed anything living nearby, but the gases reached around the world. Sulfurous gases can cool the atmosphere in the short term, while carbon dioxide warms it in the long term. When volcanoes release enormous volumes of both, "these can lead to climate swings between warm and cold periods that make it really hard for life on Earth," said Schoene. To determine how big an effect it would have had, they needed to constrain the timing of the eruptions: Tons of carbon dioxide erupted in a hundred years will have very different effects than the same volume outgassed over the course of a million years. Of the four eruption pulses, two took place before the mass extinctions, with the second beginning only tens of thousands of years before the Chicxulub impact -- a geologically short amount of time. "The first two pulses ... correspond with a period of time where climate fluctuated from cold to hot to cold again, and many scientists think this indicated an initial disruption to the climate that may have contributed to the mass extinction event," said Schoene. "Our data show that maybe the second pulse could have played an important role in the extinction itself because it happened right before it." Keller is more definitive in her conclusions: "Deccan volcanism is the most likely cause of the dinosaur mass extinction," she said. "The Chicxulub impact may have contributed to their demise, though the timing and environmental effects of this impact still remain to be determined." "In general, I think this paper is significant and interesting," said Pincelli Hull, an assistant professor of geology and geophysics at Yale who was not involved in this research and who has argued against the role of the volcano in the mass extinction. "The paper is a huge advance in timing the [Deccan Traps] eruptions, but how that relates to the timing of outgassing is still a major question that needs to be resolved to figure out exactly what the relevant roles of volcanism and impact were." 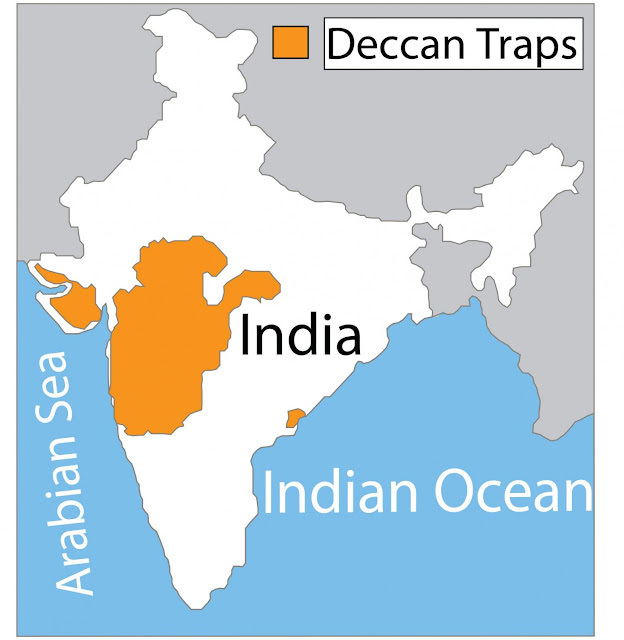 The researchers will continue to tease apart the effects of the one-two punch of the Deccan Traps eruptions and the planet-shaking impactor, said Eddy. "Regardless, it seems like the end-Cretaceous was a terrible time to be on Earth."